You are here: Home / Recipes / Condiments / Homemade Salsa! Last Monday, I spent the day in the hospital awaiting the arrival of the Little Peanut. She is my newest pride and joy and I can’t believe she is a week old. I stayed at their house for a few days, and did some cooking but didn’t take many photos of the food. Wonder why? 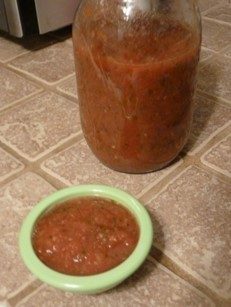 I did make a batch of my daughter’s fabulous salsa and thought I would share her easy recipe. I eat it on everything….like a good little Texan. In a blender, put the onions, jalapenos, jalapeno juice, cilantro, lime juice and part of the diced tomatoes (for a little liquid) and give it a few pulses to blend….,keeping it a little chunky. 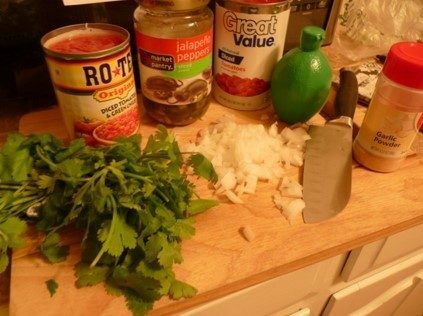 Add the rest of the tomatoes and Rotel and finish blending….again….keeping it a little chunky. Pour into a quart jar and eat it on everything! Easy! If you want this to have a chipotle flavor, add a pepper out of a can of chipotle peppers. If you want to make a peach salsa, just chop up a peach and blend it into the beginning of the process. Thanks for the linky! I’ve been waiting all week to link this one up … SO tasty!! I’m making more today … with lemon & blueberries today! OOoo YUM! I LOVE biscotti! Awwwww Congratulations on the Peanut! She is beautiful. I know this is not your peanut. I am putting it everywhere for Susan. She’s a doll! Susan can’t get over the fact she has Black Hair! She keeps saying it over and over!